Fettuccine alfredo recipe that is quick and easy...with a healthy twist...but still that rich, creamy and delicious taste. Melt butter in a saucepan over medium heat. Whisk in the flour to form a roux, cook for 30 seconds. Whisk in the Vegetable Bouillon, milk, and Alfredo mix until smooth. Add the sun dried tomatoes. Cook the mixture over medium heat until it begins to thicken, about 5 minutes. Transfer to a blender and puree until smooth (there may be some small pieces of sun dried tomato that won’t blend, that’s fine). Transfer back to saucepan. Add the peas and bell pepper, and cook until heated through. Toss pasta in sauce, garnish with fresh parsley and Parmesan cheese if desired. Enjoy! Method of Preparation In a saute pan render the 8 slices of bacon until they are crispy, then crumble the bacon into small pieces and place to side for later. Begin to cook the fettucini noodles according to their package directions. Next, rub the chicken breast with your favorite Wildtree spice mix and either grill or bake to an internal temperature of 165F. When the chicken is done, cut into medium thick slices. In a small saucepan, heat the milk and butter until the butter is melted and then add the Alfredo Extraordinaire and whisk until smooth. When the noodles are finished cooking, drain the water and return to the pot and pour the Carbonara sauce over the noodles and lightly toss to fully coat the noodles. 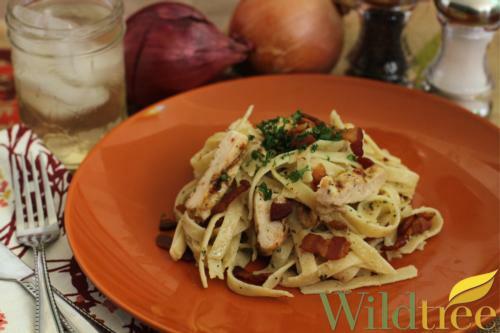 Place noodles in a seving dish and garnish with chicken, bacon crumbles and parsley. 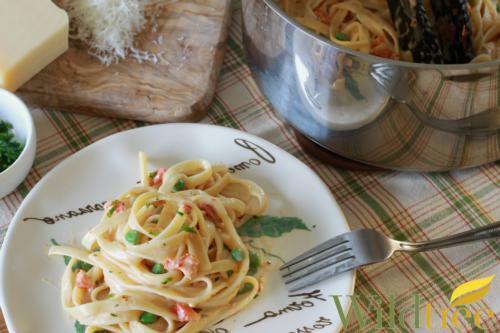 A classic fettuccine alfredo recipe.